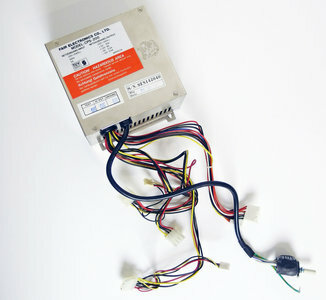 Fair Electronics model CPS-200 230V AC-DC AT power supply. Power supply for use with late 80's and many 90's pc's. Comes from Highscreen Colani pc. This item was last tested at 10 January 2019. - Power supply could be turned on. - Fan of the power supply spinned and was silent. - Supplied power to a tested CD-ROM drive.